Artist, weaver, educator, writer and printmaker Anni Albers (b. 1899) is one of the most widely recognized figures of craft and textile history in the United States. This hand woven sample for a wall covering embodies both Albers’ innovative approach to materials and structure, as well as her belief in the importance of designing textiles suitable for industrial production. The sample is comprised of horizontal alternating stripes of rich ochre and oatmeal. The warp is undyed linen, and the weft is created by twisted paper and cellophane strips. The piece appears organic and physically durable, reminiscent of pre-Columbian textiles as well as the rural vernacular of the American south. Though we can’t say for sure, this sample from 1945 falls within the time period that Anni Albers was living and working at the experimental Black Mountain College in North Carolina (1933-1949), so it may have been produced there. Albers’ influential weaving workshop at Black Mountain College had a strong theoretical foundation; she refused to teach the techniques of the local American tradition of colonial-patterned weavings copied from drafts, instead preferring a more experimental approach. She strongly advocated for a deeply sensory experience, or a “tactile sensuousness.” In fact, she often encouraged her students to explore the surrounding natural landscape and incorporate found objects – like leaves or twigs – into their weaving experiments. 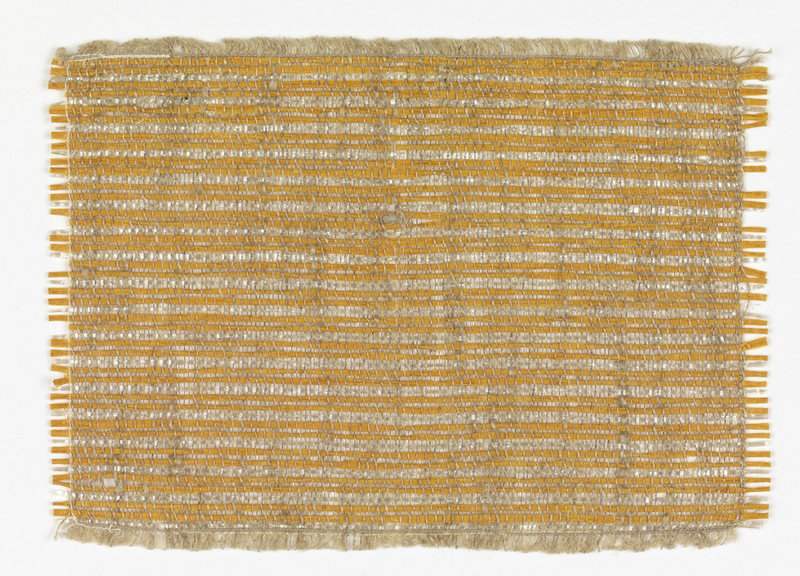 The culmination of Albers’ work at Black Mountain College was her solo exhibition at the Museum of Modern Art in 1949, when she was the first weaver in history to have a solo show at a New York City museum. Jacqueline Sullivan is a graduate student in the History of Design and Curatorial Studies program at Cooper Hewitt. She serves as a Master’s Fellow in the Textiles Department. Anni Albers, “Work with Material”, Black Mountain College Bulletin no. 5 (November 1938): 6.